This recipe was originally posted in 2015, but has been updated with new photos and recipe details. Hey lovely people! We are officially into spring! Earlier this week, I shared a meatless three bean chili with you guys. I promised a sidekick to go with it so today I’m bringing you a re-shoot of a delicious cheesy cornbread recipe. I absolutely love corn as is, but have in a bread recipe? SOLD! This recipe is extra corny (hehe), not only from cornmeal, but also from corn kernels. Plus, it can be whipped up in about 10 minutes! Unless you have a recipe for cornbread from your grandmother passed down for generations, this is the only cornbread recipe you will need…it’s that good. I love anything cooked in a cast iron pan! I think that’s what makes this one so special. 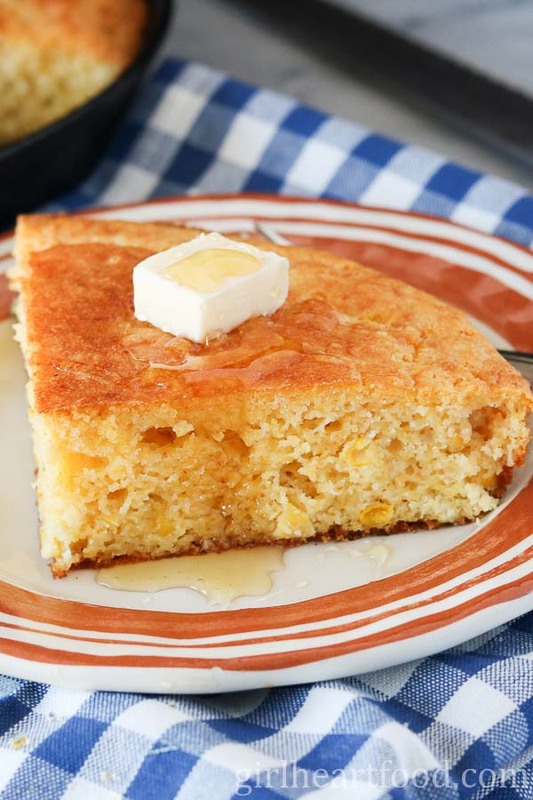 Like most of the recipes you’ll find on Girl Heart Food, this skillet cornbread uses simple, wholesome ingredients and is ultra easy to prepare. For this skillet cornbread recipe, you basically mix up the dry ingredients, then the wet and combine the two into a preheated cast iron skillet (generously doused in butter and some oil). Preheat oven and place cast iron skillet in there to get nice n hot! In a bowl mix together milk, cream, melted butter, cheddar, eggs, onion and corn. In another bowl stir together flour, cornmeal, sugar, salt, baking powder and cayenne. Mix together dry and wet ingredients, stirring to combine. Carefully remove hot skillet from oven and swirl in some butter and oil. Once butter is melted pour in cheesy cornbread batter. Can I Make Cornbread Muffins Instead of a Skillet Cornbread? Absolutely! I’ve definitely done this before and it’s great when you’re having a get together with a lot of people. Everyone gets their only little muffin for dunkin’. If you are opting to make cornbread muffins instead of a skillet cornbread, skip the step where you put the pan in the oven. Instead, line a muffin tin (you will need 2) with liners, spray with baking spray and bake for about 18-22 minutes (check on after 18 minutes). They’re done when a wooden skewer inserted comes out clean. Let cool a little before digging in. You’ll yield roughly 18 cornbread muffins. Totally! Place in freezer safe bags or containers and freeze for up to 3 months. Mix in some marinated or fresh jalapeno pepper to taste instead of cayenne. Like your cornbread more cheesy? Add a little more cheddar. Speaking of cheese, I’ve also added in some crumbled feta and it works beautifully. Preheat that cast iron pan! When you pour the cornbread mixture into the greased pan, it bubbles a little around the edges and creates a lovely crust as it bakes. Don’t overbake your cornbread. Check on at 35 minutes with a wooden skewer. If it comes out clean, it’s done. If not, bake a little longer. To garnish I love a lil’ honey drizzled on top. It just takes it to another level. The savoury and sweet flavour combination hits the spot! Hope you enjoy this skillet cornbread as much as we do! Until next time, take care and chit chat again soon! This Cheesy Skillet Cornbread is made with both cornmeal and corn kernels and lots of cheese! It's baked right in a cast iron skillet and is a perfect side with chili or your favourite soup! Preheat to 375 F and put a 10 inch cast iron pan in there to get nice and hot. In a bowl, add milk, cream, butter (4 tbsp. or 1/4 cup, melted), cheddar, eggs, green onion and corn. In another bowl mix, flour, cornmeal, sugar, salt, baking powder and cayenne. Add this flour mixture to milk mixture and stir well to combine. Carefully remove the hot cast iron pan from the oven; add remaining 1 tbsp. of butter and 1 tbsp. of veg oil and swirl around until butter is melted. Pour in the cornbread mixture. It'll bubble a bit around the sides. Bake for 35-40 minutes until cooked through and golden. Garnish each slice with a dabble of butter and honey, if desired. Enjoy! We love our cornbread in the South… It is a beloved staple. Adding in the cheese and corn makes this bread look fantastic! I will have to make this with our next Sunday dinner. Oh my gosh- this is how my mom makes cornbread. I want a huge piece and a bowl of beans! I love everything about this cornbread! Now to hav some chili along with it!